These are only some of the events of 1968. Fifty years ago, the Grand Lodge granted a charter to Airline Central Lodge 2323. The airline industry was in full growth, the job market was strong, and unions had built up their strength enough that we bargained with real power. IAM Local Lodge 2323 represented workers at Air Canada and was part of a robust airline industry. The membership of the local grew steadily and, despite some setbacks, still grows because of their organising efforts. LL2323 now has one of the largest memberships in Canada. The local (and the airline industry) has seen many changes since they were first chartered into the IAM, including the merger of Air Canada and Canadian Airlines. They endured many strikes against employers to ensure members’ rights, wages and benefits were protected or improved. 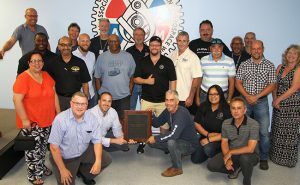 Stan Pickthall, Canadian General Vice-President presented a plaque to the local from the Executive Council of the IAM to recognize 50 years of struggle and of representation. 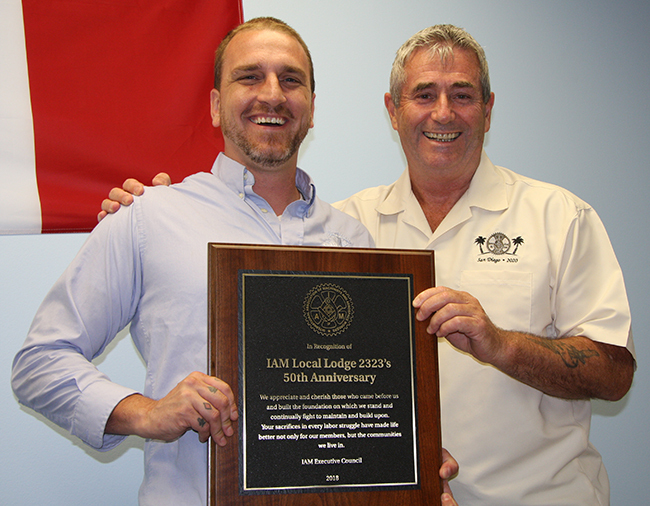 Dave Flowers, President of LL 2323 accepted on behalf of his members. “We have drawn from the membership of Local 2323 and have two Grand Lodge staff working out of the Canadian Office,” said Pickthall. “We know the kind of leaders who emerge from your ranks, and we do not hesitate to call on them when we need expertise,” he said. In accepting the plaque, and the acknowledgement of the fierce work done by 50 years of leaders, Flowers talked about the past challenges – and future ones. “We have come so far because we fought for our members and we got through the storms created by circumstances as well as those who dislike unions. And we will continue for another 50 years,” he concluded. The almost 5,000 members of Local Lodge 2323 are employees of Air Canada in Toronto, Ottawa and London, Ontario and employees of TBH at Pearson Airport. ***Toronto’s Pearson Airport, where most of LL2323 members work, is named after Lester B. Pearson. Medicare was fought for by Tommy Douglas and the NDP – and IAM activists were a key to its becoming law. Some of those Czech refugees eventually became members of Local Lodge 2323!